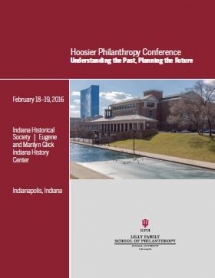 Part of the Indiana Bicentennial Celebration, the IU Hoosier Philanthropy Conference will be a two-day event celebrating 200 years of Hoosier philanthropy and examining the state’s future philanthropic trajectory. The “Hoosier Philanthropy Conference: Understanding the Past, Planning the Future” will explore the role philanthropy has played in the development of Indiana’s public life and envision ways in which philanthropic action can continue to advance the public good. Led by the Indiana University Lilly Family School of Philanthropy, located on the Indiana University-Purdue University Indianapolis (IUPUI) campus, conference partners include the Indiana Historical Society, Indiana University, Indiana University Foundation, Indiana University-Purdue University Indianapolis (IUPUI), and the IUPUI Arts and Humanities Institute. The keynote speaker will be Lilly Endowment Inc. Chairman of the Board, President and CEO N. Clay Robbins. The title of Robbins’ remarks is, “Philanthropic Variety: Perspectives from an Indiana Practitioner.” Plenary speakers include: James Madison, Thomas and Kathryn Miller Professor Emeritus of History at IU Bloomington; Dwight Burlingame, Glenn Family Chair in Philanthropy at the school; and Gregory R. Witkowski, conference chair and associate professor of philanthropic studies at the Lilly Family School of Philanthropy. "The generosity of individuals and institutions have played an instrumental role in supporting the social, educational and cultural fabric of the Hoosier state for 200 years and it is fitting that as part of the state’s bicentennial, the IU Lilly Family School of Philanthropy – the first school of its kind in the nation – host this important conference on the future of Indiana philanthropy,” said Indiana University President Michael A. McRobbie. “We are also honored to have Lilly Endowment Inc. Chairman Clay Robbins as the keynote speaker for this event. Lilly Endowment, one of the world’s largest charitable foundations, has left an indelible mark on Indiana and IU for nearly 80 years through its extraordinary generosity." The Feb. 18-19 conference is part of Indiana’s celebration of two centuries of statehood and is sanctioned as a bicentennial event by the Indiana 2016 Bicentennial Commission. It will be held at the Eugene and Marilyn Glick Indiana History Center, 450 W. Ohio St. in Indianapolis. The first day of the event will feature engaging discussions between philanthropy scholars and practitioners, including nonprofit leaders, donors and volunteers analyzing trends in the nonprofit sector and discussing ways in which philanthropy may help shape Indiana’s future. The second day of the conference will feature a wide range of examples of philanthropic engagement from the past. Presentations by both established and emerging scholars will indicate the variety of philanthropy in Indiana's history and provide the context for understanding current trends. A wide array of topics will be addressed during the event, including charitable giving, new forms and frontiers of philanthropy, community engagement, volunteerism, Hoosier philanthropists and philanthropic institutions past and present, and philanthropy’s role in key aspects of society such as social services, health, higher education, religion, the arts and the environment. "We are very pleased to partner with IUPUI to host this particular conference at the Eugene and Marilyn Glick Indiana History Center. The Indiana Historical Society is the oldest private not for profit in the state. Since our founding in 1830 we have greatly benefitted from the strong philanthropic traditions fostered by the generosity of the English, Smith, Lilly, Reahard, Lacy and Glick families to name a few," said John Herbst, Indiana Historical Society President & CEO. As part of the conference, Indiana Historical Society staff will lead a workshop titled, “Preserving Philanthropic History.” The program, designed by IHS to help local history organizations address important issues such as capacity building and collections stewardship, offers this hands-on approach to encourage greater confidence and comfort with fundraising at the local level. Registration is now closed. Media wishing to cover the conference may contact Adriene Davis Kalugyer, 317-278-8972, adrldavi@iupui.edu or Diane Brown, 317-274-2195, habrown@iu.edu.